Concept mobile phones present designers’ ideas. They always have extreme design, extra options, and, often, the feature to be transformed. Unfortunately, not all these unbelievable ideas will be realized. But let’s see what interesting concept mobile phones exist nowadays. Number 10. Actually, the idea of Triple Watch is not fresh and extraordinary. The triple flip technique lets the user of the gadget to convert the watch into a usual mobile phone. 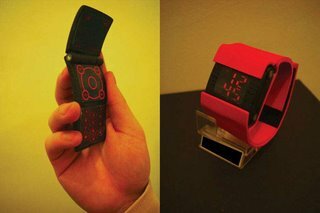 The advantage of such gadget is the following: it has a speaker button, so while using it as watch you may talk on the phone and do anything you want, your arms are free to do any actions. Such phone might be rather handy for drivers, teenagers while skating or skiing, children in order not to lose the device. Number 9. 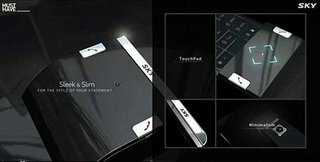 Sky “Sleak n Slim” mobile phone is based on the latest touch screen technology. But what really attracts attention is its design. It is really unusual, but, to be honest, I’m not sure if such form is comfortable while using the phone. 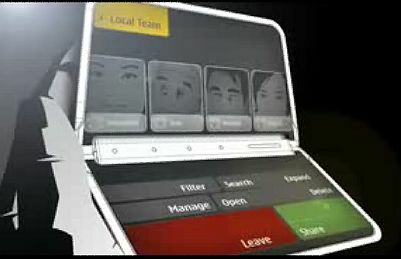 The characteristics of this device are that is has discretely glowing touchpad and hideaway keys. The gadget looks stylish, modern and fashionable. Number 8. Nokia 888 Communicator takes almost any form you like. The design is cool and modern. Speaking about the features of this gadget, it is important to say that the phone uses liquid batteries, speech recognition, touch-sensitive body cover and flexible touch screen. This Nokia concept phone looks like the phone from the 22nd century or a fiction film. Number 7. 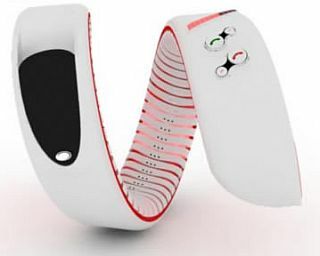 This concept phone will help you always to feel the incoming call, because it will be situated right on your wrist. 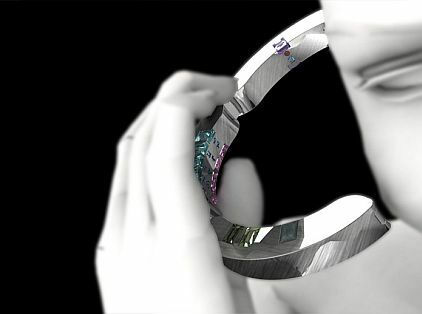 Bracelet Phone with Built-in MP3 Player looks like a fashionable accessory, but with some extra-features. The diamond-like keystroke will help you to operate the phone. The gadget also has a built-in MP3 player, but it is not the novelty nowadays. Number 6. CUin5 Concept Cell phone is definitely something unusual and fresh, because every part of the gadget carries a keypad, microphone and speaker. While using one part of the telephone, the other parts are in lock mode. But it looks like the only function of this gadget is to call and receive calls. There is no display, which means you won’t be able to send messages. Interesting idea and realization, but I guess it wouldn’t find its users. Number 5. BenQSiemens Snake phone looks like a perfected combination of Triple Watch and Nokia 888 Communicator. Its design is more glamorous but there are doubts about the functionality and comfort while using this phone. It looks like a snake and it was designed to be put on your wrist. There are just a few buttons on it but the shape makes this gadget not really handy. Number 4. At first sight Dark Label Retroxis Phone doesn’t look different from other modern mobile phones. But it has some interesting functions. At first, it is unbelievably light. Secondly, while you don’t use the phone, imperceptible OLED display silently hides away. Thus, the gadget looks clean, unusual and fashionable. Number 3. Black Box Concept Phone might seem a little bulky. 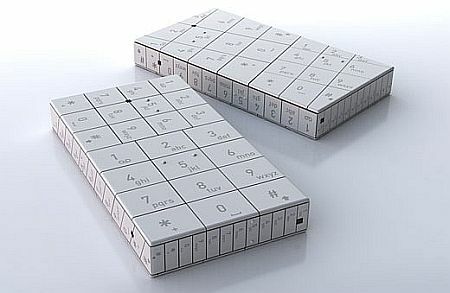 But its difference from other concept phones is that it changes the control layout according to the functions you need. This new idea and its realization might find its fans. Number 2. 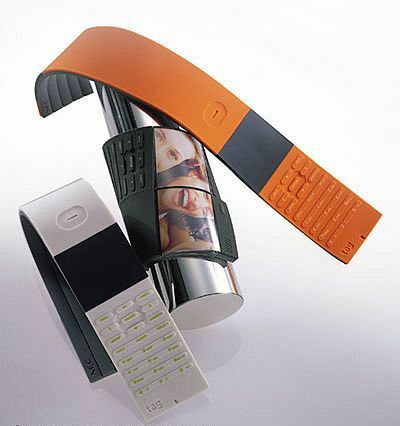 The designers of the concept phones often make their gadgets flexible. NEC Tag concept phone is one of these kinds. You don’t have any restrictions. You may put it into any shape you like according to your mood. Number 1. 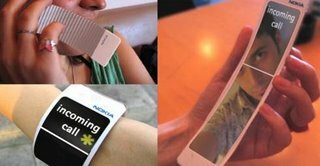 Nokia Archive Concept Phone should open us the door to the newest level of communication. With the help of this dual-touch screen gadget wireless conferencing will be available for everyone. It will guarantee you qualitative and clear communication. Thanks to pretty design and great characteristics this mobile concept phone is number one today.